Approximate true-color view of the southern hemisphere of Uranus made from images acquired by the Voyager 2 spacecraft in January 1986. Scientists have just confirmed what every third-grader has known for nearly 170 years* as irrefutable fact: Uranus smells like stinky farts. First of all, I’m assuming you’re used to using the pronunciation “your-AY-nus,” which of course in English provides all sorts of opportunities for comedy. But if you use the other (and technically more correct) pronunciation “YER-ah-nus” then perhaps we can proceed with a modicum of dignity here. Researchers have identified the chemical signature of hydrogen sulfide in the upper atmosphere of Uranus, the pale blue gas-enshrouded ice giant located between Saturn and Neptune. 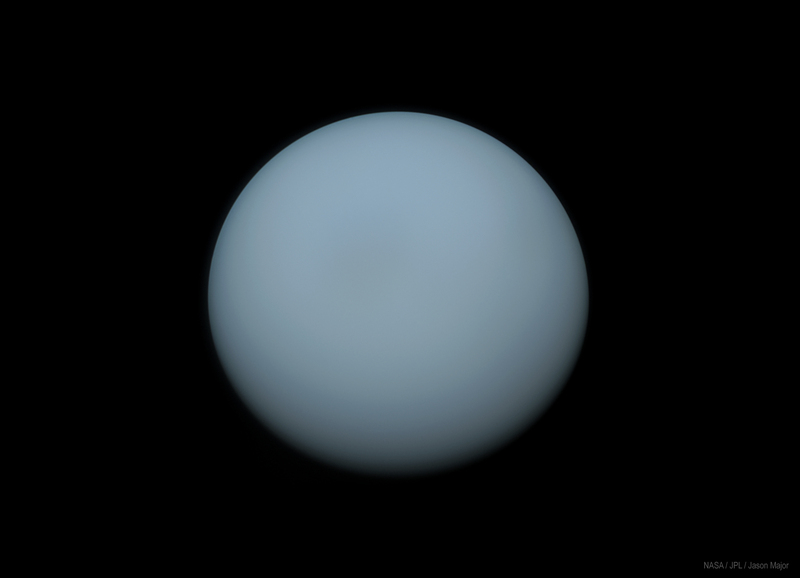 See more articles about Uranus here. Hydrogen sulfide—H2S—is the molecule responsible for the unmistakable stench of rotten eggs…and yes, stinky farts. P.U. Closer gaseous planets to the Sun Jupiter and Saturn don’t appear to have any detectable H2S in their upper atmospheres, but Uranus does. Given the long-standing fun kids (and adults) have had with the planet’s name, it seems fitting. But in actuality the confirmation of the compound’s presence really is a new discovery. “We’ve strongly suspected that hydrogen sulfide gas was influencing the millimeter and radio spectrum of Uranus for some time, but we were unable to attribute the absorption needed to identify it positively. Now, that part of the puzzle is falling into place as well,” said Glenn Orton, one of the team’s researchers from NASA’s Jet Propulsion Laboratory in Pasadena, CA. The findings were made using data acquired by the Near-Infrared Integral Field Spectrometer (NIFS) on the 8-meter Gemini North telescope on Maunakea in Hawai’i. It’s very likely that Neptune, located even further out than Uranus, also has hydrogen sulfide in its upper atmosphere…although it’s only speculation at this point. Both planets contain large amounts of hydrogen, helium, and methane in their atmospheres—the latter of which absorbs red wavelengths of light and gives them their bluish color. But methane to us is odorless…hydrogen sulfide is certainly not. So if for any reason you were to stick your head in Uranus and take a deep breath (don’t forget our pronunciation lesson now) you would likely wonder who was responsible for the smell…that is, before your face froze off in the -300ºF temperatures and you suffocated from the lack of any breathable oxygen. Then again, it might be a welcome end were you to find yourself stuck on a stinky planet four times the size of Earth. Read more from the Gemini Observatory here and from NASA here.